We are in era of unprecedented value creation, and its symbol is the Unicorn — a company that rapidly gains to a valuation of a billion dollars and beyond. While pundits are again asking “Are we in a bubble?” entrepreneurs are asking a more vital question: “What are the secrets that allow fresh startups to scale so dramatically?” As the chart below shows, some founders are increasingly unlocking the secrets, as the time taken to get to a billion dollar market is rapidly shrinking. The sobriquet of Unicorn came from a seminal article from venture capitalist Aileen Lee in November, 2013, and from that point on, the meme of Unicorns has permeated startupland. As investors query new startups, the elephant in the room has been replaced by the single-horned equine, as potential funders ask whether the hoodied founders before them will indeed create Unicorns. It is not just a fantasy. Some wonderful products like Slack are exploding out of the gates, adding to the mystique of the label. But in all this mania to find Unicorns, very few are analytically asking, “How do you become a unicorn?” or “Why are they doing so well?” In our recent book, Mike Malone, Yuri van Geest and I (and our research team, led by Michiel Schuurman) have been exploring these issues, as well as crafting a condensed, how-to guide to building Unicorns. It is our thesis that Unicorns have worked out how to scale their organization structures in a completely new way. Our name for this is Exponential Organizations. Over the last couple of decades, the tech industry has learned how to scale technology. A startup can go from a hundred to millions of users without blinking. What’s less clear is how to scale the actual organization structure — that has always been a painfully linear and incremental process. 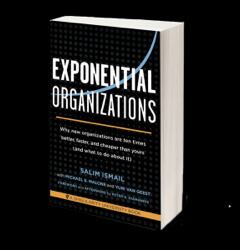 The book, not surprisingly named Exponential Organizations, was released in October 2014 and received the Frost & Sullivan GIL 2014 Book of the Year award. On Friday, the first international language version was released in Holland. We have been researching this phenomenon for three years and have identified dozens of startups we consider to be Exponential Organizations, or ExOs. The basic metric that we have established is that ExOs scale at a minimum 10x better than their peers in the same space. For example, a typical CPG (Consumer Packaged Goods) company like Johnson & Johnson or Proctor & Gamble takes about 300 days to go from a new idea to a product on a Walmart shelf. Quirky, a leading ExO, does that same process — new idea to product on a Walmart shelf — in just 29 days. And that’s in an old industry, not some newfangled internet-software-freemium-social-gaming play. Over the course of our research, we have been grading a large number of organizations and recently, we released our list of the top one hundred ExOs worldwide. You can find the company names at the bottom of this post. Here’s how we arrived at the scoring. We created a diagnostic survey that quantifies the core scalability of an organization — we call it your Exponential Quotient. We worked with our team and a group of 160 ExO Experts in 45 countries who helped in this endeavor. We looked at successful startups founded after 2005 and a number of large companies and ran them through the scoring, giving extra weight to scorers that knew the company well (e.g. I worked at Yahoo, therefore…). We then added supplementary information (location, number of employees, sectors covered, etc). Who Are the Exponential Organizations? We found considerable overlap between ExOs and Unicorns. Of the top 100 ExOs, 35 are considered Unicorns. Fully 35% of our Top 100 are considered Unicorns from either Aileen Lee’s list or Fortune’s list. Fully 65% of our Top 100 are between 11 and 500 employees, with none smaller. The vast majority of exponential organizations are no more than ten years old. This means most companies on the list are still startups and not yet fully grown into corporations. This also indicates that startups have less trouble implementing exponential attributes and that the paradigm is quite new. The top five sectors represented are Social/Blogging/Messaging, E-Commerce, Finance, IT & Cloud, Gaming/Entertainment and finally, Staff on Demand. Select a Massive, Transformative Purpose (or MTP) like Google’s “Organize the World’s Information or Quirky’s “Make Invention Accessible.” All ExOs we’ve found have such a mission. Join or create relevant communities (see Meetup!). Chris Anderson’s DIY Drones community is a great example. Over 50,000 drone enthusiasts participate. In the most advanced companies, the community drives everything but the purpose. Compose a founding team (optimally four people). We recommend a visionary, UX expert, engineering guru and a business/finance expert. Select a breakthrough idea that delivers a minimum 10x improvement over the status quo. Let’s note that we don’t begin with the core idea — that way you’re not tied to a particular solution, but rather the problem space. Build your Business Model Canvas (see Lean Startup). This simple process generates nine key elements to consider in the business model (including partnerships, channels to market, USP, etc). Find your Business Model — basically, how will you make money? Many startups today deliver new business models as a way to compete against legacy companies (Netflix being a prime example). Build the Minimum Viable Product (or MVP — again, see Lean Startup). What’s the smallest feature footprint that allows you to get to market and get feedback from users? Note for many successful web products (e.g. Twitter, Foursquare, Facebook), their initial product was quite flaky — the design flawed and the user interaction questionable. But they iterated rapidly with initial customer data and were ultimately successful. Validate marketing and sales channels. Groupon spent 18 months in one city getting the sales and marketing footprint just right. Then they quickly replicated that in dozens of cities. Organize so that core mission-critical functions are occurring outside the core organization (e.g. Uber’s matching of driver and passenger is not handled by its core team). Aim to be a platform. Successful ExOs (Apple, Google, Amazon) are all platforms. Companies that didn’t achieve that (Yahoo, Blackberry, Nokia) ended up in trouble. Whether you call them Exponential Organizations or Unicorns, it’s clear this is a very new way of doing business. In our research, a very fundamental economic thesis arose out of studying this new breed of companies. When running a business, you worry constantly about the cost of generating demand and the cost of managing supply, and you try and fiercely optimize around each side of that equation. The Internet, for the first time ever, allowed businesses to drop the cost of demand generation exponentially via online marketing and referral marketing — in fact, if you achieve a viral loop (e.g. 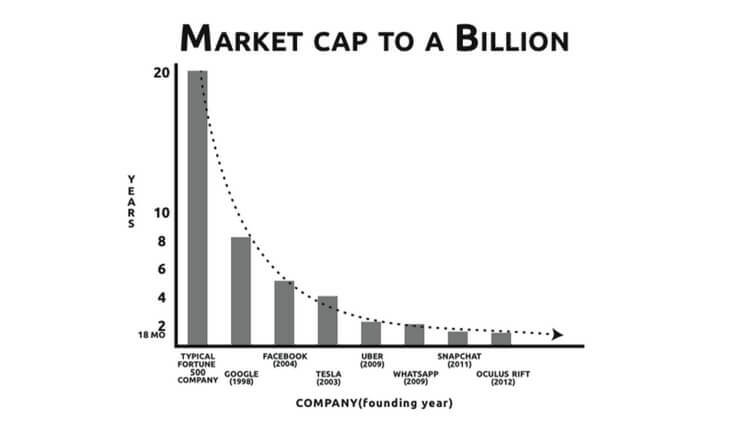 WhatsApp), your acquisition cost goes fully to zero. So, if you want to be a Unicorn, scale your org structure outside the core team and find a way to drop your marginal cost of supply. 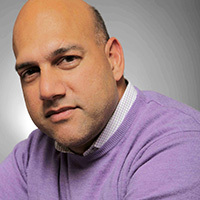 Salim Ismail is the lead author of Exponential Organizations and the founding Executive Director at Singularity University. Yuri van Geest is the co-author of Exponential Organizations, the Dutch Ambassador for Singularity University and a global expert in mobile technologies. Michiel Schuurman has led the research team for ExO and has a background in digital marketing and strategy.